Bright, colourful party decorations make even the most simple things seem instantly festive. These pom-pom party sticks are a great way to liven up a basic cake. The best part is that after the cake's been cut you can re-use these vibrant baubles - as swizzle sticks in summer cocktails, to decorate little pot plants, or as photo booth props at your next party. If you have a pom-pom maker, skip ahead to Step 3. If not, here's how to make one using a small bowl or other circle shape (around 4.5cm in diameter) and the cap of a glue stick. 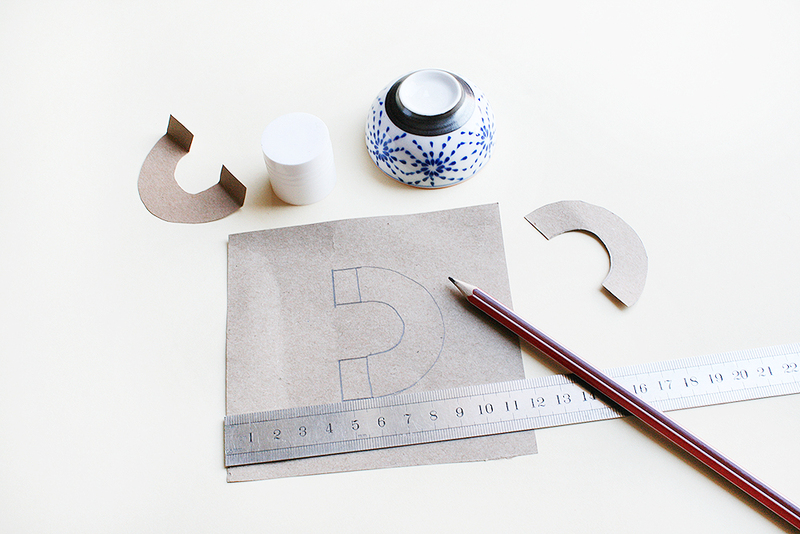 Trace around the bowl onto card stock, cut it out, then place the cap in the middle of the circle and trace around that. Fold the circle in half and cut along the center line to create 2 semi-circles. Cut around the inside circle line of one of the semi-circles to create an arch. Trace the arch onto card stock and add a 1.5cm tab onto the end of each. Cut this new shape out and fold the tabs up. You will need four of these shapes in total. Place two pom-pom maker pieces together with the tabs sticking out. Wrap wool all the way around the arch. The more you wrap, the fuller the pom-pom. Repeat this with the other two pom-pom maker pieces, but use a different color wool. Place one piece on top of the other and staple the tabs together. Using fabric scissors, start cutting all the way around the circle. 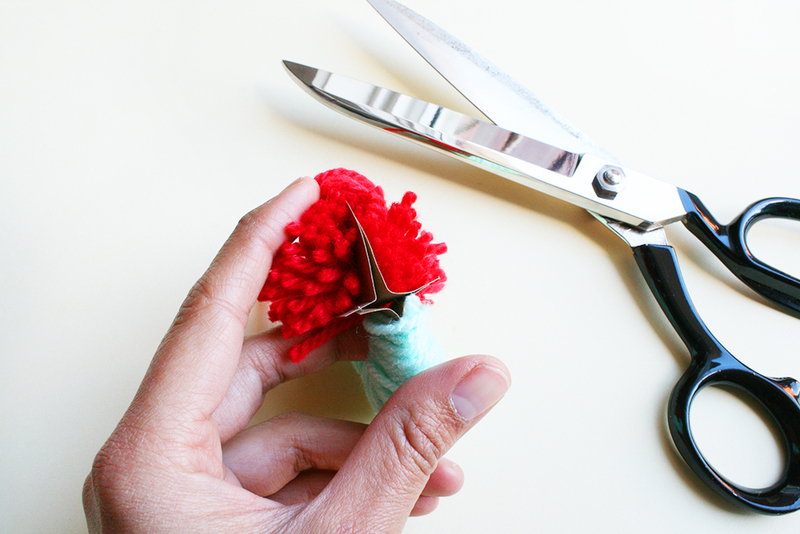 The blades of the scissors should slip in between the two card layers of the pom-pom maker. Place a piece of string in between the two card layers and tie it around the wool in a tight knot. Pull the card layers off and trim the pom pom until it forms a neat ball. Make some smaller pom-poms by trimming more wool off. Cut the skewers to varying lengths. 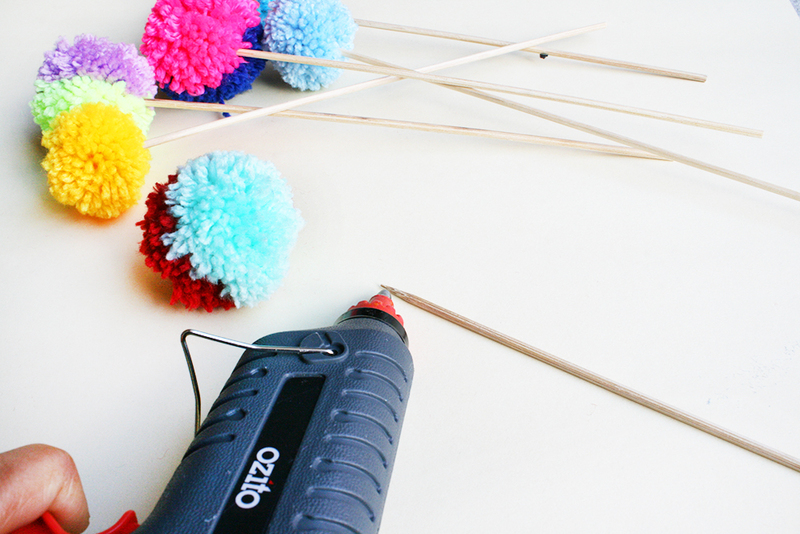 Use a hot glue gun on the end of each skewer and gently press it up into the pom pom. Liven up your celebration cakes with your new pom-pom toppers. For cupcakes, use smaller pom-poms and toothpicks. 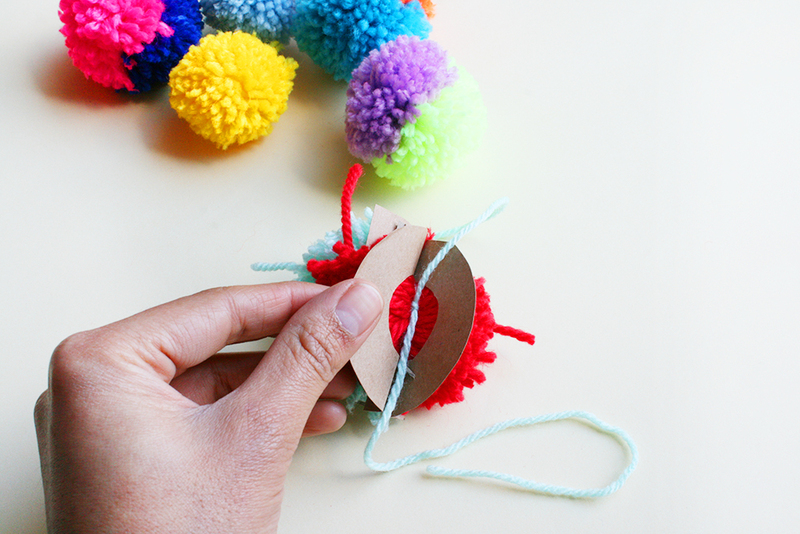 In this tutorial you learned how to create your own a pom-pom maker and two-toned pom-poms. By using a hot glue gun you learned how to attach each pom-pom to a skewer, creating a delightful cake topper. Do you like making pom-poms? 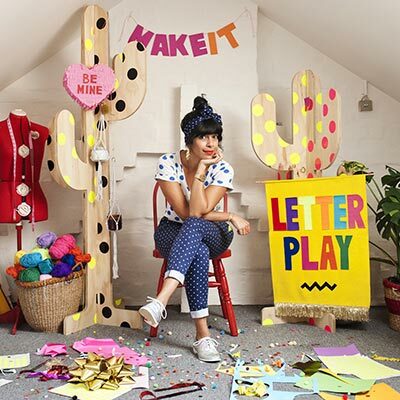 Would you like to see more pom-pom projects on Crafttuts+? Let us know in the comments below.